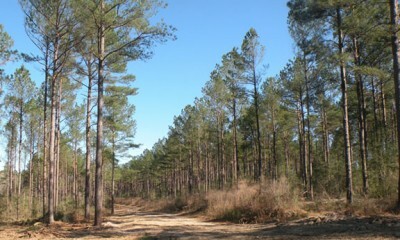 This is a larger tract that consists of very high quality un-thinned planted pine timber. The tract was accessed using an existing property opening by removing every third row or approximately 50% of the standing volume. The tract is being thinned to approximately 200-300 trees per acre. The harvesting consists of accessing the pines and removing every third row, then thinning the remaining rows. This is a beautiful tract of timber and the goal will be to remove any of the weak or diseased trees to allow room for the stronger, healthier trees to continue to grow and mature into quality log timber. Below are some pictures of the property. We will continue working on this project into July. This month has been very big for us in the sense that we have added on several new harvesting crews. These harvesting crews come with many years experience and a solid reputation in the forestry industry. There has been a mutual interest in teaming up for the last few years but the timing never was quite right. Fortunately, this time around, all parties were able to make everything work and we couldn’t be more excited about this addition. This means added production for Choctaw and our landowners as well as quicker harvesting times. We will now be able to move quicker from one tract to the other without the added time of waiting on our other harvesters to finish their prospective tracts. The addition of these crews has expanded our territory westward, allowing for new tracts and possibilities. The reputation and efficiency in harvesting of these new crews is one of the main reasons we wanted to bring them on. Having extra loggers with this type of reputation will only help bring value to our company and our landowners. We’re excited about the possibilities and look forward to what the future will bring. At the beginning of this month we took on a new intern, William, who is currently attending Mississippi State University where he’s pursuing a degree in Forestry. We’ve started helping him gain hands-on experience by allowing him to cruise several tracts of timber, coordinate with landowners, flag lines, and organize harvesting operations. So far he has been nothing short of a success and a huge asset to our company. 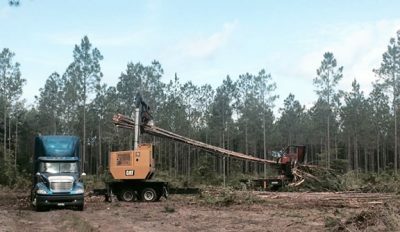 Choctaw Land & Timber’s Crew 2 is teaming up with the Jay Odom Group to perform a harvesting on the Hammock Bay property located in Freeport Florida. Before any harvesting began, our procurement managers met with the landowner to discuss any and all harvesting techniques to ensure the best practices are being performed on the property. This harvesting operation will follow all Florida’s Best Management rules, regulations, and guidelines. A harvesting plan and map was presented to the harvester before the timber operation began, ensuring our team and landowner agree and understand the process of the harvesting so no detail is overlooked. 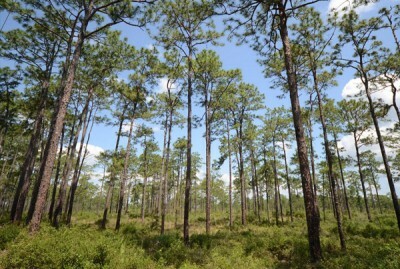 This tract consists of high quality planted pine timber and will be second thinned and third row thinned, removing approximately 45 to 55% of the standing volume. The remaining tree count will be an average of 50-75 trees per acre with no hardwood harvested from the property. 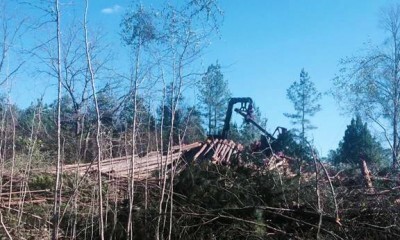 When trees are harvested, they are being pulled to an established loading area, separated into different log classes and products to ensure maximum timber value for each product. No harvesting is to take place in or around well points on the property flagged and established by the landowner, and all harvesting equipment will remain clear of these areas. Choctaw will personally maintain all roads during the harvesting operation or if needed, will repair to original condition when harvesting is complete. We’re happy to be working with these landowners on this project and have ensured that our harvesting team keeps all details and specifications in mind. Our goal is to ensure the landowner is happy with the product throughout the harvesting as well as when the job is complete. Working on a larger tract such as this can bring certain challenges, but our goal is to make sure our harvesting crew understands exactly what is expected of them and have a clear plan to get the job done right. A big part of what we do and what we feel brings success is keeping in constant contact with the landowner so they are aware of what is going on and stay up to date throughout the entire process. 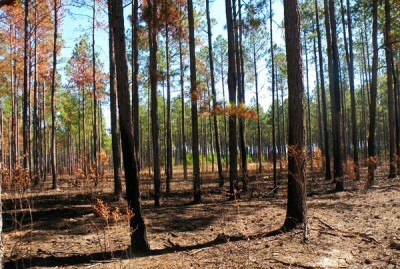 This specific tract of timber in Geneva County, Alabama consists of planted pine timber. Our harvesting crews are accessing through existing openings and thinning to target weak, diseased and/or damaged trees. We are also targeting trees 18 inches Diameter at Breast Height, or DBH, and above, and removing approximately 50% of the standing volume. Before any harvesting began, our team collaborated and proposed an established forestry plan for this landowner. 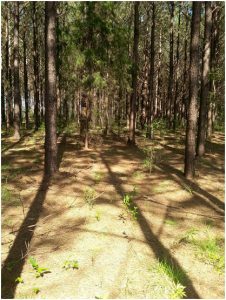 Our procurement team did a 10% line plot cruise of the standing timber to mark off certain areas and flag lines for accuracy in harvesting. Pole timber has also been marked for removal from the stand of planted pines. The idea is to remove the inferior timber, allowing room for the stronger, healthier trees to grow and mature into quality log timber. Where log trees have canopies and the tops have grown together, the higher value trees will be left to continue growth and mature into higher quality and more valuable timber in the future. 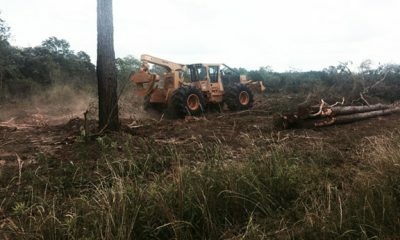 The purpose of this type of forestry operation is to allow for enhanced growth of the remaining trees and future thinning and income to the landowner. Starting with a proven and established forestry plan before any harvesting begins is always critical to our operation. Before any work begins we get to know the landowner and their specific goals and future objectives for the property upfront. Mapping out a forestry plan and practice will ensure the landowner receives the most value for their timber now and for the future. That’s the difference you feel when working with Choctaw Land & Timber! 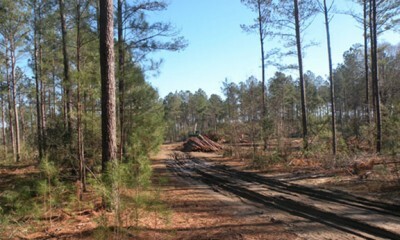 Clear Cutting in Coffee County, Alabama! 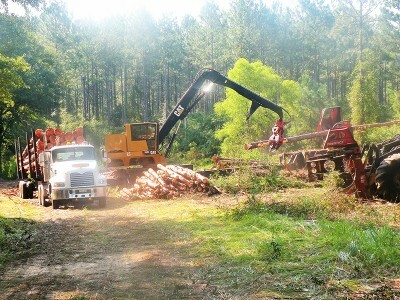 Take a look at one of our harvesting crews clear cutting pine pulpwood in Coffee County, Alabama. The process of harvesting a tract begins far before the first tree is ever cut down. With proper planning and careful practices, clear cut timber harvesting is a very beneficial forestry practice. Our process starts any clear cut with our harvesting crews and procurement team going over the property and collaborating on what and how things need to be done in order to benefit us, the landowner, and the future of their forest. We are not just a harvesting company. “We also have the timber side to consider and therefore we understand the process as a whole,” says James Adams, Manager of Choctaw Land & Timber. We always consider potential issues that may occur and do our best to avoid negative impacts. Our goal is to provide the best forestry service possible to keep landowners coming back. We encourage them to replant and use reforestation techniques so that after 15 or so years when their forest has regenerated, they will enjoy the financial benefit of the timber investment they’ve made! The new Catepillar 525D Skidder allows for faster production and more efficiency on this clear cut in Covington County Alabama. We’re excited to welcome our newest addition to Crew 2! Our brand new 2015 525D Skidder was just delivered to us from Thompson Tractor! 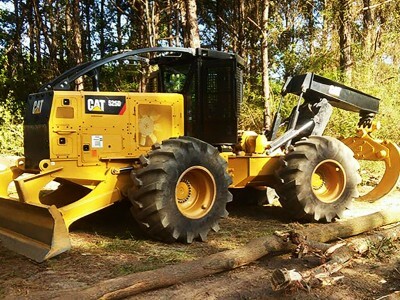 This piece of forestry equipment has a specific purpose which is used during timber harvesting operations to pull cut trees out of a forest and onto the loading ramp. You can see Crew 2 pulling the cut timber to the loading ramp where it will be separated into products, cut to spec and loaded onto trucks to be sent to their specific mill. This piece of equipment is much more fuel efficient, better for the environment and most importantly will help us make timber production quicker! We are looking forward to seeing the success of Crew 2 with this machine which they’ll be able to use for many years to come! 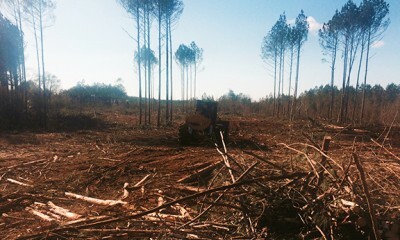 Below are a few shots in action of Crew 2 working with this new machine clear cutting a tract in Covington County Alabama! 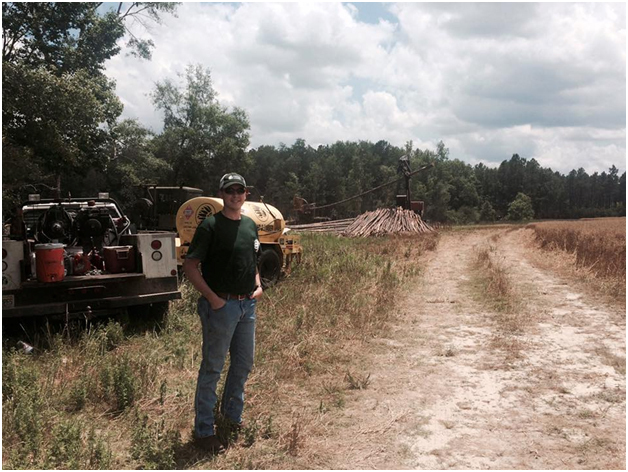 Crew 2 is currently performing a harvest on a large tract in Covington County, Alabama! This piece of property will be clear cut and then prepped for a pine replant. 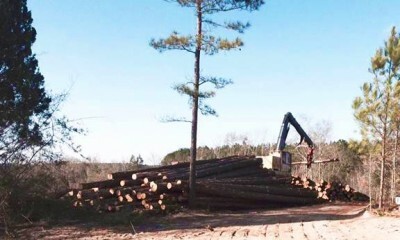 The Choctaw Land & Timber team are experts in the field of timber and harvesting. They understand what it takes to help a property reach its full potential and work closely with each other and landowners to achieve these goals! Choctaw Land & Timber is a full service, fully integrated timber company. Working with Choctaw Land & Timber means working with a team that are experts in their field, and have a deep knowledge and understanding of the forestry industry. 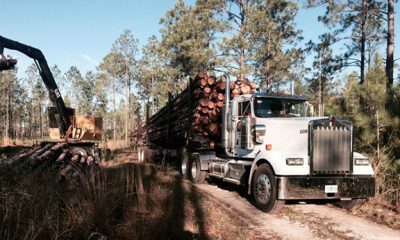 Over the years, Choctaw Land & Timber has succeeded in perfecting multiple aspects of the business from timber purchasing, timber harvesting and more. Meeting Your Forestry Needs Is Our Business! 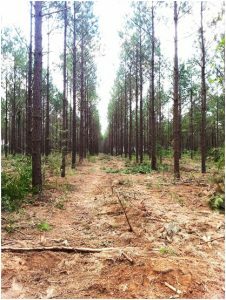 Preparing your land to use for timber, harvesting, sporting, recreational or even forestry investment purposes requires expertise, quality care and service. 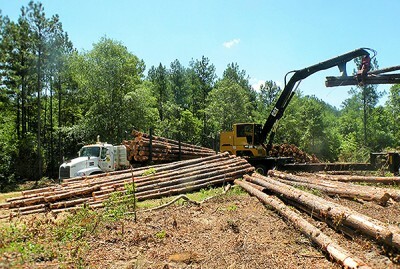 Choctaw Land & Timber provides professional forestry services to our clients at every phase of the forestry lifecycle, with the precise knowledge and techniques you need. Choctaw Land & Timber is first and foremost a family-owned business. Our company has over 50 years combined experience in the forestry industry. This expertise allows us to provide a multiple phase company, offering services to our clients including timber purchasing and harvesting, various land services, trucking and reforestation. Due to our reputation for success and excellent service, our business continues to grow throughout northwest Florida and southern Alabama. Our team focuses on two key aspects of the forestry and timber business: productivity and efficiency. Both are essential for ensuring that our clients receive top value for their timber product in a timely fashion. A love for forestry fueled by knowledge of the latest and best practices enables us to succeed in each project, no matter the complexity. 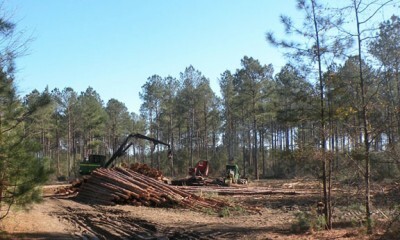 Choctaw Land & Timber works with you at each step of the forestry process. If you want to manage your land for timber, wildlife, or recreation, we can help you develop a plan. Looking to purchase timber investment land? We can help guide you in finding your ideal investment so that your property provides you the value you need today, and tomorrow. Our harvesting crews are company owned. This means we can provide our clients with the services they need as quickly as possible guaranteeing dependability. Our crews are trained in the latest practices and certified in the master logger program. Finally, we work with one of the most reputable companies to offer you reforestation and management services customized to meet your personal goals as a landowner. The team at Choctaw Land & Timber is proud to launch our new website. This new space allows us to introduce ourselves and services to new clients as well as keep long-standing clients up to date on the latest developments. Be sure to check out our Recent Projects page. Many thanks to Diane Minks at Focal Point eSolutions for helping us create our new and improved site. We look forward to working with Diane in the future for website hosting and maintenance. 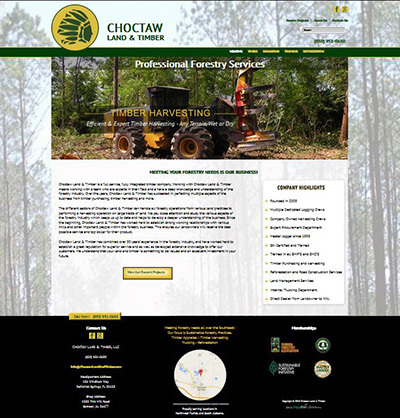 The Choctaw Land & Timber professional forestry services website is up and running! Thanks to Diane Minks of Focal Point eSolutions for taking Choctaw Land & Timber to the internet via our new website! It was a wonderful experience and we look forward to continuing our relationship with Diane as we expand the website. 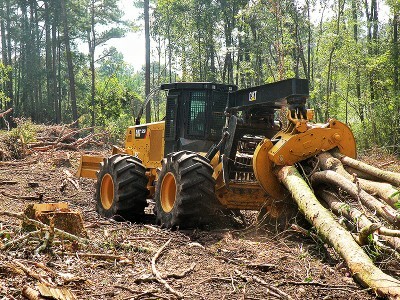 Choctaw Land & Timber is a full service, fully integrated Professional Forestry Services company. Working with Choctaw Land & Timber means working with a team who are experts in their field and a have a deep knowledge and understanding of the forestry industry. Over the years, Choctaw Land & Timber has succeeded in perfecting multiple aspects of the business from timber purchasing, timber harvesting and more. Northwest Florida and South Alabama.